Big Red Car here. It is the day after Labor Day and the Big Red Car turns serious for a few minutes. In the hysteria of The Donald’s hair and Presidential aspirations, Hillary’s dissembling about all matters pertaining to her decision to use an unsecured email server, and the surfeit of hot dogs — you may have missed that the Middle East is aflame and that the fires are burning particularly hot in Syria which enters its fourth year of blood in the streets. The Syrian Civil War started in March of 2011 when the government of President Bashar al-Assad captured and tortured some teenagers who had painted “revolutionary slogans” on buildings. The citizenry began to demonstrate in opposition to al-Assad whereupon the government killed some of the demonstrators. This lead to armed demonstrations which lead to more killings which lead to an open rebellion against the government. By the end of 2011, things were dicey and violent and the Syrian government had turned to killing the rebels. The population of Syria is approximately 23,000,000 people of whom it is alleged some 250,000–320,000 are now in their graves while as many as 1,500,000 have been wounded. Of the dead, approximately 11,500 are children. It is always a bad sign when you cannot get the number killed closer than a 70,000 spread. An additional 11,000,000 Syrians have been driven from their homes by the violence and some 4,000,000 have fled Syria and taken up refuge in neighboring countries such as Turkey, Lebanon, Jordan, and Iraq. Another 6,500,000 have been displaced internally. Some 150,000 have been declared political refugees and have been granted asylum in Europe primarily in Germany and Sweden. Note also that internal refugees may never be able to return to their homes as their homes have been destroyed. Bashar is Syria’s President, the Commander-in-Chief of its military forces (a particularly useful post if you intend to slaughter your opposition), and the General Secretary of the Ba’ath Party (you may recognize the political party of Saddam Hussein, a neighboring despot of some fame). The 49-year old despot is the son of Hafez al-Assad who ruled Syria for thirty years prior to Bashar taking over in 2000 upon Hafez’s death. Bashar is a graduate of Damacus University’s medical school and was further educated at the Western Eye Hospital in London achieving a specialization in ophthalmology. He is an educated man. He was elevated to the President by the unopposed confirmation of the People’s Council of Syria who “voted” him into office. 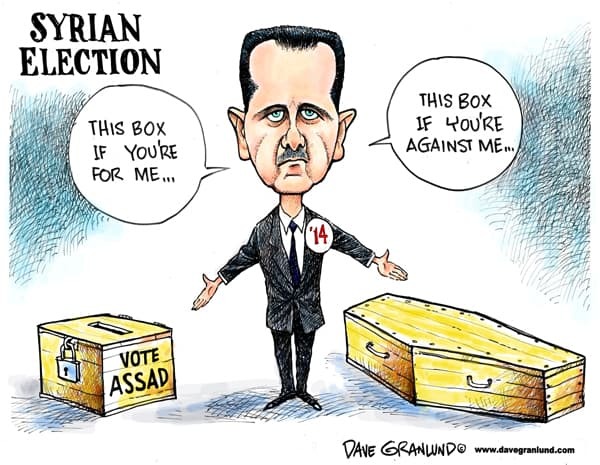 There was a “contested” election in 2007 in which Bashar convinced 97.6% of all Syrian voters to pull the lever for him. Wow! Though he contends his rule is “secular” in nature, he is a member of a small sect — the Alawites who are a distinct minority in the country. His rule is an accident as Old Man Hafez had been grooming his eldest son, Bassel, for the job. Bassel managed to get himself killed in a car accident and the job fell to Bashar. Hafez had almost seven years to prep Bashar to become a tyrant and a despot. One of the key training assignments for the President-in-waiting was the Lebanon Portfolio which was the Syrian occupation of southern Lebanon. Good training for a future despot. When the Lebanese Prime Minister spoke out against Syrian involvement in his country in 2005, he was assassinated in an act attributed to the Syrians. Just when he took office as President, Bashar al-Assad conducted what is called the Damascus Spring wherein he shut down a notorious prison, Mezzeh Prison, and released hundreds of Muslim Brotherhood members (the same Muslim Brotherhood who our President assisted in rising to the rule of Egypt — that worked out pretty great, no?). It lasted for less than a year whereupon he began to throw the same bunch in jail. He also began a partnership with Hezbollah which led to close ties with its sponsors in Iran. This partnership with Hezbollah and Iran has become an important element of Bashar’s survival and world view. Hezbollah, of course, is dedicated to the extermination of Israel, a neighbor of Syria. Iran is not a member of the Israeli fan club either and provides most of the funding for Hezbollah (except for the $300,000,000 annual stipend coming from Turkey). Since taking office, President Bashar al-Assad had been an outspoken critic of the United States, its involvement in the Middle East (get in line, Bashar), Israel (funding Hezbollah being a pretty good indication), Saudi Arabia, and Turkey. Turkey being a huge funder of Hezbollah itself makes this currently a little less strident. The Americans, together with the many members of the European Union, have been opposing the regime of Bashar al-Assad, providing assistance to the opposition, conducting air strikes in the country in support of the rebels, and providing humanitarian aid. The regime is receiving assistance from Vladimir Putin’s Russia and the Iranians. It is reported that the Russians, who have leased a Mediterranean Sea naval facility from the Syrians for some considerable time, have begun to conduct direct combat operations — air support, armor, artillery — in support of the regime. It is important to note that it appears that Bashar al-Assad is going to survive and the rebellion will ultimately be crushed thanks in no small part to the assistance of the Russians and the Iranians. Some Americans got it so wrong that they initially thought that we should support Bashar al-Assad. Hillary Clinton, in 2011 when the rebellion started, argued that we should actually support the al-Assad regime. If you didn’t see it, you couldn’t believe it. This man will have wrecked his country — killed, wounded, displaced more than half of his country — and survived. Amongst the initial opponents to the Bashar al-Assad regime were Al Qaeda elements. Think about this for a second. In the power vacuums of Libya, Egypt, Syria who flowed in and tried to seize control? Al Qaeda in Libya, the Muslim Brotherhood in Egypt, so why not in Syria? These terror groups were all trying to obtain a safe harbor — as they did in Afghanistan where their training camps were originally located — and to seize a country to make their own. As it turned out, these land seeking terrorists became the genesis of ISIS which is an effort to create a caliphate and to harness the same ambitions of land ownership. We, essentially, created, funded, and supported the rebellious elements that would become ISIS. The al-Assad regime possesses and uses chemical weapons against the rebels and its own people. 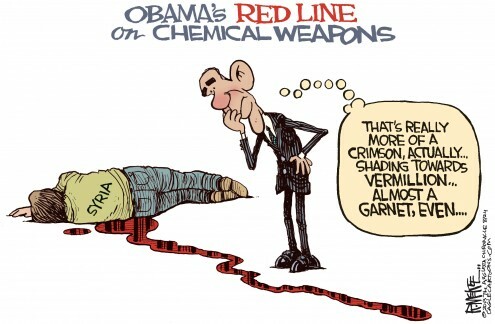 President Obama, famously, issued his “red line” threat assuring the world that if the Syrian government deployed chemical weapons the United States, acting unilaterally, would punish Bashar al-Assad and punish him mightily. It was the famous RED LINE which turned out to be a head fake wherein President Obama backed down in the face of Russian opposition. There was a bit of to-ing and fro-ing and a phony appeal to the United Nations wherein the Russians have a Security Council veto power. In the end, we spoke softly and carried a limp noodle. Bashar al-Assad continues to use chemical weapons. The United States dallied when it could have intervened decisively by refusing to pick an opposition party to support, arm, and train. By the time it did, it was left with Al Qaeda elements who ultimately morphed in to ISIS. When we did finally attempt to train opposition forces, we refused to arm them adequately and when they entered Syria, they were eliminated immediately. The US fecklessness has emboldened Iran and Russia to the extent that both are now supplying direct military aid and, in the instance of Russia, direct combat support by Russian troops. It is hard to imagine how this situation could possibly have gotten worse. The US continues to launch air strikes into Syria with no clear strategy of objective. And, yet, every step of the journey is in front of us to observe, test, critique, and evaluate. 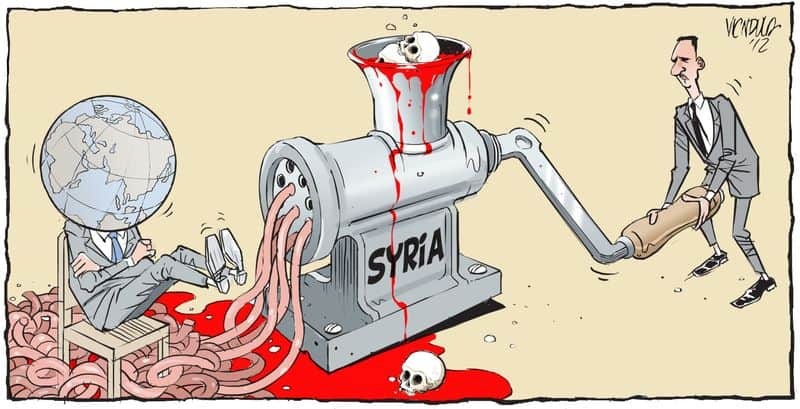 It is a chain of blunders (including the failure to act) and failures whose cumulative impact is the survival of a brutal despot, the destruction of the Syrian people, and the creation of a Russian client state in the Middle East. Can you imagine what is must be like when half of a population is displaced? But, hey, what the Hell do I really know anyway? I’m just a Big Red Car. Pray for Syria. Pray for competent American leadership. This entry was posted in America, Foreign affairs and tagged syria, syrian civil war. Bookmark the permalink. I’m no expert on Syria, but from a little reading it appears that the Assad side, the Alawites, are essentially Shiites and that the rebels were a mixture of Kurds and Sunnis. By now the Sunnis are at least partly, maybe heavily, ISIS. And, of course, Iran is Shiite. So, it’s the 500+ year old Shiite-Sunni war. And, as in Iraq, with the Kurds, it’s another three way civil war. As Kissinger said about the Iraq-Iran war (Saddam was Sunni), “Too bad they can’t both lose” or some such. Well, in Syria, they, likely all three sides, are. At least this time, the US isn’t losing much. Good. I’ve lost patience with the Shiite-Sunni wars. It appears that the only peace they can have is the grave. What the heck is going on? I.e., it appears that there are tens of millions of suffering civilians and, among the leaders, plenty of bad guys but few or no good guys. I very much do not like Obama, e.g., for his immigration policy, bowing to the leaders of China, Saudi Arabia, Japan, and France, his climate change alarm-ism, his over active EPA, etc. Otherwise, on nearly all issues, I see Obama as doing a little to get a headline and then doing nothing or nearly so. And on Syria he has done nothing or nearly so, but, in this case, I agree with him. My take on Syria: The core problem is Islam. In some of the Islamic countries, Islam runs everything — education, dress codes, social roles and norms, marriages, diet, architecture, the media, the legal system, foreign policy, the government, religion, everything. It’s all they have. And that Islam comes in two versions, and the two versions fully agree on their most important interest — send their young men to kill off the others, put the excess women in harems, and keep them pregnant. The Shiites and Sunnis have been that way for 500+ years; it’s all they know; and they are not going to change soon. It’s just what they long have done and still do. The US tried to give Iraq a constitutional, secular, parliamentary democracy, but as soon as the US started to leave, Iraq went back to their old Shiite-Sunni wars with the Kurds also on the side. Iran is close to the Iraqi Shiites, maybe about to unify with the south-eastern part of Iraq, and ISIS grew up among the Sunnis. What can Russia do in Syria? Sure, in the rebel areas, bomb the leadership. If that doesn’t calm down the anti-Assad side, then bomb everything that is not a tent or a camel. If that doesn’t work, then bomb the tents and camels. This Russian effort will involve defeating over half, maybe 80%, of the Syrian population. If killing everything but the people and livestock doesn’t work, then the effort will kill them. Then the Assad side will have what it wants. Net, the Alawite-Shiites, Iran, and Russia will get control of the rebel areas, maybe quite short on rebels, buildings, people, camels, or even tents. This is bloody business, and, for whatever reason, Obama or otherwise, net, the US has no stomach for that business — good. There might be other implications, e.g., Syria, Russia, and Iran taking over also the Sunni areas of Iraq and, thus, giving Iran a 100% Shiite path from the Caspian Sea to the Persian Gulf to the Mediterranean. There might be implications for Israeli security — e.g., from Syria, Iran could scream “Death to Israel” and fire nuclear bombs at Israel. The Shiites and Iran would have control over much more of the oil. Then Iran might go after the rest of the Persian Gulf oil. There might be a nuclear war with Saudi Arabia. But how could Syria, Russia, and Iran get the Iraqi and Syrian Sunnis to quiet down? Sure, just the way the US refused to do — kill off all or nearly all the rebels, men, women, children, “flocks and herds”, etc. Wouldn’t be the first time in history. The Syrian Civil War will result in more than a third of a million dead, 1.5MM wounded, 4MM refugees fleeing the country, 6.5MM refugees internally displaced, and the victory of Bashar al-Assad with the assistance of the Russians and Iran. It did not have to be so.